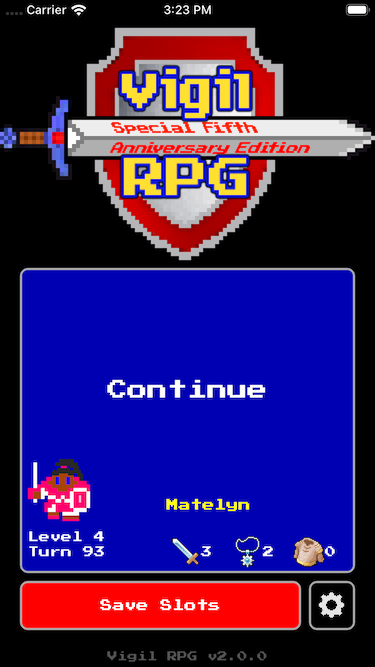 Vigil RPG is an old-school-style turn-based RPG game for iPhone, iPad, and iPod Touch. What makes Vigil RPG fun? Created by a one-person development team with a design goal of maximum fun, not commercial monetization! Vigil RPG has NO in-app purchases, ads, action timers, or any other "feature" included for profit at the expense of enjoyment. Enemies and hero skills designed to make for actual interesting combat! Every enemy has unique attack patterns for a clever and observant player to overcome. A combat system based on very low values -- deal 3 damage on a hit, not 389 -- makes it possible for a player to plan ahead and perfectly optimize their actions in combat. Select an action and launch each combat round in a single tap. Each round plays out in about one second. Vigil RPG doesn't waste your time! Vigil RPG has NO frustrating on-screen D-pad common to console-port RPGs! All hero movement is via super-easy-to-use tap controls designed specifically for the touchscreen platform. In-game rewards as well as GameCenter leaderboards that reward skillful gameplay, not spending lots of time over-preparing and grinding! Grab your favorite beverage in one hand and your phone in the other! Vigil RPG is designed for easy one-handed play, via portrait orientation and easy-to-reach button placement. Never manually save your game again. Game progress is always automatically saved! Quit at any time -- even mid-combat -- and the game will always pick up exactly where you left off. Jump right back into the game from where you left off by continuing your most recent game from the title screen with a single tap. Much of Vigil RPG's story is delivered through brief eBook-style page sequences. The Vigil RPG story takes place in the barony of Arboria, where the hero sets out to discover why goblins and other monsters have suddenly begun maurading across the countryside. The town of Arboria offers all of the comforts of a typical fantasy town! 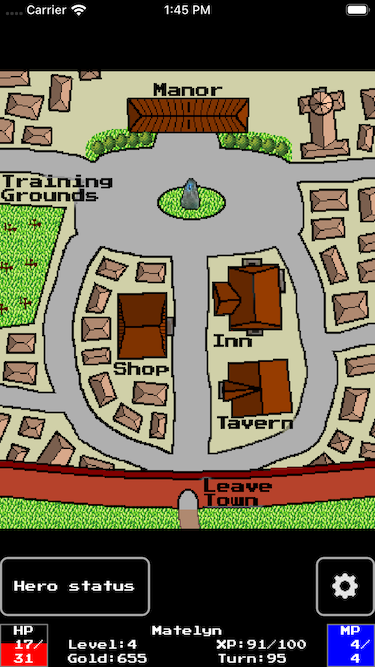 Among them are an inn for healing, a tavern for picking up quests, and a training grounds for selecting a set of up to 6 skills to take adventuring. Combat is turn-based. The player selects their action each round with a single button tap -- no digging through sub-menus. The hero has a small pool of MP (mana points) which partially replenish after each battle. There is often tension between spending MP to quickly defeat the current enemy, versus saving MP to take on the next enemy encounter. Vigilant players will also keep a close eye on what the enemy is doing. Many enemies will cue a special attack the round before making it. Other enemy type have particular patterns they follow, which a clever player can discover and exploit! Vigilant players will also keep a close eye on what the enemy is doing. Some enemies will cue a special attack a round before making it. Other enemy type have particular patterns they follow, which a clever player can discover and exploit! Each move the hero makes while travelling on the world map costs a turn. Other events, such as resting at the inn or being defeated in battle, consume turns as well. Vigil RPG's in-game rewards and GameCenter leaderboards reward heroes who can most efficiently triumph over the various threats facing Arboria in the shortest amount of time! Vigil RPG was designed and developed in Michigan by a University of Michigan CS grad!